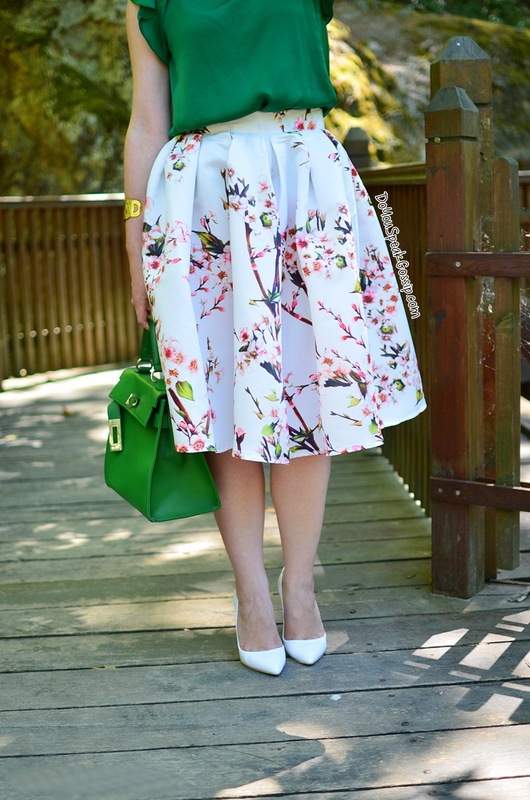 Sakura print full skirt for my anniversary | Outfits - Do You Speak Gossip?Do You Speak Gossip? Hey Laura! You’re right! It’s been a while since I last read one of your comments, but I completely understand how difficult it can be with work and everything else. I’m glad you found some time to visit my blog and comment again, and of course for liking my posts. Είναι πράγματι πανέμορφη αυτή η φούστα. ΄Οπως και οι φωτογραφίες! Σου πάει τέλεια! Κούκλα, κούκλα!!!!! Christina recently posted..Jewelry Workshop Volume 2 – για προχωρημένους! Σ’ευχαριστώ πολύ πολύ Χριστίνα μου! Φιλιά πολλά! Aww thank you so much! Its quality is not the best, but the design is gorgeous, although the skirt is quite “puffy”. But I couldn’t resist! πόσο όμορφη! αυτά τα χρώματα σου πάνε πολύ! If I like the outfit? I loved it! Couldn’t be more beautiful and perfect than that! Simply stunning! You look gorgeous, and I liked both versions, with the stilettos and with the ballerinas! The bag is also amazing and the whole session shows a lot of style! As usual! I know that when I say “my favorite” outfit you just come and surprise me again 🙂 So now I have the pleated Largenti dress, Green/pink belt dress and I have to decide which one in the top 3 places – either the red outfit last week, or this one! Oh, I’ll take both 🙂 You always look amazing! Makia! Aww thank you so so much for your amazingly kind and sweet words. You’re always complimenting me on my outfits. The ballerinas didn’t do the skirt justice, and I looked like a little gnome with tiny legs when we were taking photos from above. But I shared the best possible ones on the previous post. But thank you again for saying that. I’m glad that I clicked over to see your couples photos because they are drop-dead gorgeous. Also, I love the bag and how lady-like it looks—I’m sad that it’s from a local shop and I can’t buy it here. At least the skirt is available and at a great price point. Aww thank you so much! Unfortunately, not only the bag was bought from a local shop but it is also kind of an old one, since I bought it 3 years ago. 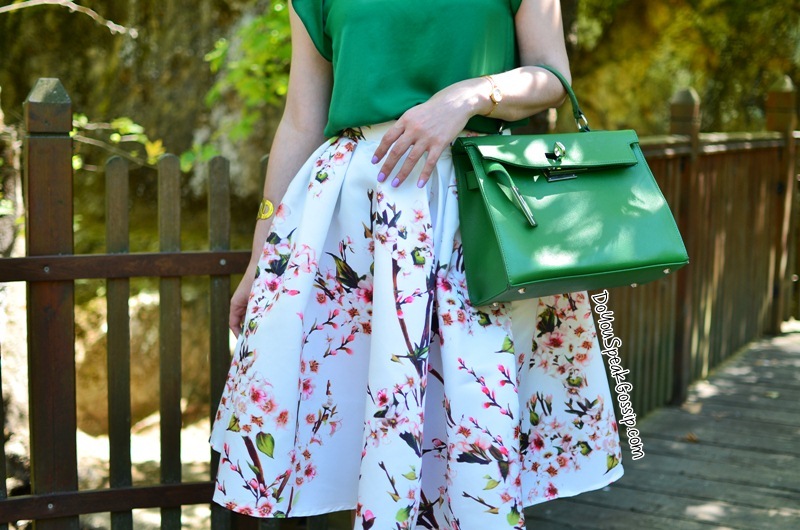 It is inspired by the Hermes Kelly bag, something I really loved, and has a great quality since it’s Italian. But no brand label inside, I’m sorry. You can see a few close up shots in one of my older posts here: http://www.doyouspeakgossip.com/2011/05/don%e2%80%99t-call-me-kelly-bag/ if you like. wow, what a pretty skirt! i love the look of these full skirts, just wish i could wear them as well as you all!! hope you had a wonderful anniversary! oomph. recently posted..family movie night with Pop Secret. Thank you Steph. It’s indeed really full and bouncy. hehe And the print is gorgeous, but unfortunately it doesn’t have the best quality. This is such a beautiful anniversary look! I LOVE it. I saw that skirt on choies and was debating getting it, but I wasn’t sure how it would look on. It fits beautifully on you so I may have to get it! 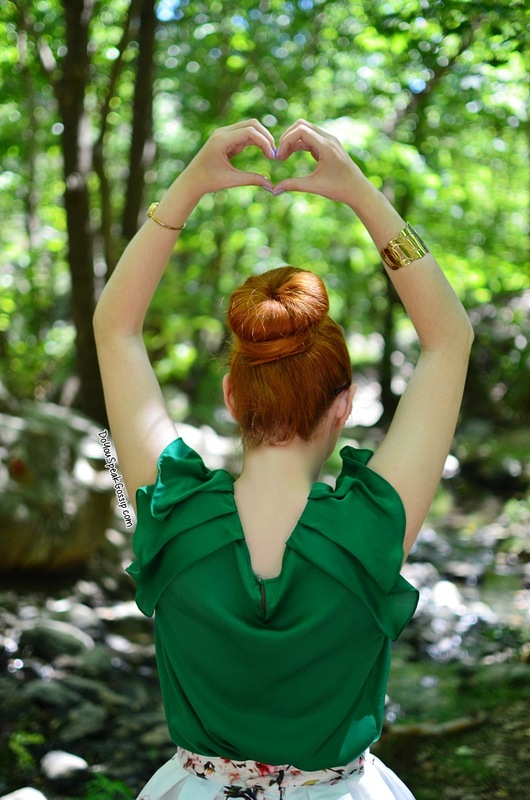 Emerald green looks great on you. I am so glad you had a great anniversary! I think that this is a perfect outfit to wear for such a special day:) The full skirt and top look fabulous together, especially on you! I hope you had a great day and an even better tomorrows! omg is really amazing look…u’re fab! Such a nice outfit, love the color combination! Thank you very much! It’s such a beautiful skirt! Aυτο το στιλ να κρατησεις σου παει! Perfection! The skirt looks even more gorgeous on you!! S’eyxaristw poli Elena mou gia ta kala sou logia opws panta. Den mporw na pw oti me zestainoun idiaiterws oi goves to kalokairi. Emena to thema mou einai na min prizetai to podi mou kai den mporw na perpatisw meta me tis goves, alla oi sigekrimenes den mou exoun dimiourgisei kanena provlima kai mporw na tis foraw kai twra to kalokairi. 🙂 Tis agapw poli kai pane me ola! Allwste den einai gia poli perpatima tetoiou eidous papoutsia opote den me zestainoun kai poli. Na’sai kala! S’euxaristw poli gia tis euxes sou! Makari giati eimaste idi polla xronia mazi. Apla den thelw na kanw varigdoupes dilwseis pou sto mellon mporei na “metaniwsw” kai pote den piezw katastaseis. Oti einai na erthei tha erthei! 🙂 xixi Einai ki o T. sxedon oso ntropali eimai ki egw, kai den thelei na ektithetai poli sta social media, alla eutixws mou kanei autes tis xares gia tis epeteious kai fisika ton euxaristw poli! Mou arese poli i fetini mas fwtografisi! Filakia polla! Ξέρεις πόσο μου άρεσε το κονσεπτ; σου πάει πάρα πολύ! και να είστε μαζί και ευτυχισμένοι, ανθρώπους που σε κάνουν χαρούμενη τους κρατάς στη ζωή σου! θα ερθω να σου κλεψω μια μερα τις ασπρες σου γοβες το δηλωνω! !